After we left Staniel Cay yesterday, we continued on to Thomas Cay where we dropped the anchor to snorkel in one of our favorite coral reefs. 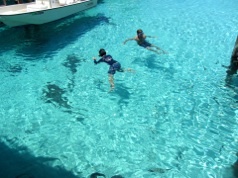 Thomas Cay has fantastic snorkeling over very healthy coral reefs populated with fish and plants. We took video with the GoPro camera and will upload it to YouTube when we have a better connection. The current was very strong so we had to tie a floating rope to the dinghy and we held on to it while we snorkeled and drifted with the dinghy over the coral heads. From there we continued on to Compass Cay where we anchored near the entrance to the marina. This morning we dinghied to the marina and paid $10 a person to be able to walk on the trails and visit the beach. The marina is known for their “pet sharks” who live under the docks. 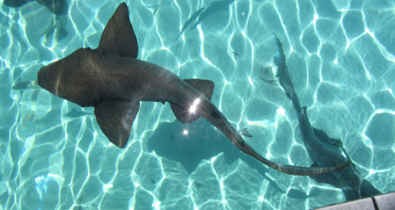 The sharks are nurse sharks and harmless as far as sharks go. People were actually swimming with them. We had on swim suits but didn’t jump in. From there we walked on a wide sandy trail to the beach. The beach was beautiful with soft sand. The marina has several covered areas with tables and beach chairs in the shade. We waded in the water and it was very refreshing. 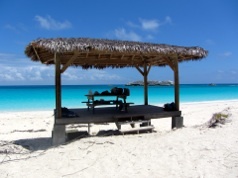 We walked down the beach in the direction of the “Bubble Bath” at the other end of the cay. We first passed “Hester’s House” which is now a ruin. Years ago two single ladies owned Compass Cay and each had her own house on opposite ends of the cay. No one else lived on the island. One night they were both driving down the one road on the island from their houses and had a head-on collision. Both were severely injured. One never came back to her house but the other, Hester, did live here for awhile after her recovery. The house is now being repaired and the rooms are being “decorated” not to live in but as something to visit along the trails. One room is the “exercise room.” There are barbells made out of wood and a real punching bag. 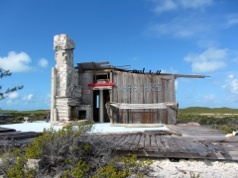 After the ladies died, the cay went back to the government and was sold to the present owner of Compass Cay Marina. We continued walking on the trails, sometimes climbing steep rocky hills. After about a mile, we saw some other people walking back from the “Bubble Bath” so we waited to hear how it was and they told us we weren’t half way there yet. It was five miles round trip over some very rocky, steep trails. There is another way to reach the “Bubble Bath” with a dinghy, so we turned back towards the marina and decided to take that route later. Back at the beach, we cooled off in the water. In the afternoon we dinghied to the end of the island and walked for about five minutes to the “Bubble Bath.” There is a large pond with steep rocks along the edge. Waves from the Sound crash over the rocks and come down into the pond, creating a bubbly effect. In the photo at the right you can see the waves starting to come over the rocks into the pond. On the left, Cathie and I are waiting for the bubbles to engulf us. The water was up to our shoulders and sometimes over our heads, but when the waves came they dissipated quickly and left bubbles and cooler water. We are going back tomorrow with the GoPro camera to take video. We returned to our boats, cleaned up, and went back to the marina. We purchased drinks from a refrigerated cooler in the store and sat on the edge of the marina docks watching a variety of fish swimming among the coral heads. The marina is not very big but it is filled with large motor yachts. Tomorrow we will move the boats to Cambridge Cay and snorkel near Rocky Dundas Grotto. 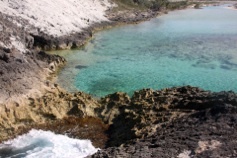 This is another one of our favorite snorkeling areas. There are also great trails on Cambridge Cay. It’s fun to ride in a dinghy along the shores of several nearby cays. One is owned by Johnny Depp. From there we plan to go to Shroud Cay and then Highborne Cay. At that point, we will cross to Eleuthera to visit until the end of May and our boat buddy Interlude will go to Nassau and back to the States.